“Feel?” asked (or prompted) one little girl, which made me smile. One very confident little man sat down next to Rebecca at the frog bog, and picking one of the stones there, told her emphatically, “Rocks are my absolute favourite thing!” He had a bit of a gleam in his eye, Rebecca said, but she suspected he must have picked up some telepathic messages from his parents, hovering nearby, because he didn’t express his love of rocks in any particularly alarming way. A little girl came up to me with the instrument she had chosen to play – a pair of blue and green resonant blocks, made of a very durable, robust plastic. She banged them together and looked at me expectantly. I matched the pitch on my clarinet and repeated her rhythm back to her. She smiled in delight, and played again. We jammed awhile, sometimes taking turns and sometimes playing at the same time. We got faster, then slower, we tried sudden stops to see if our playing partner would be able to stop in time. Then she wandered away, and so did I. One child delighted in the large autumn leaves we’d scattered throughout the installation. She approached each of us in turn – me, Rebecca, Tony, Eelin our photographer – to present us solemnly with a leaf. She didn’t speak, so nor did we. I tried to fix mine in my hair. I spotted Eelin walking around with a leaf balanced on top of her head. 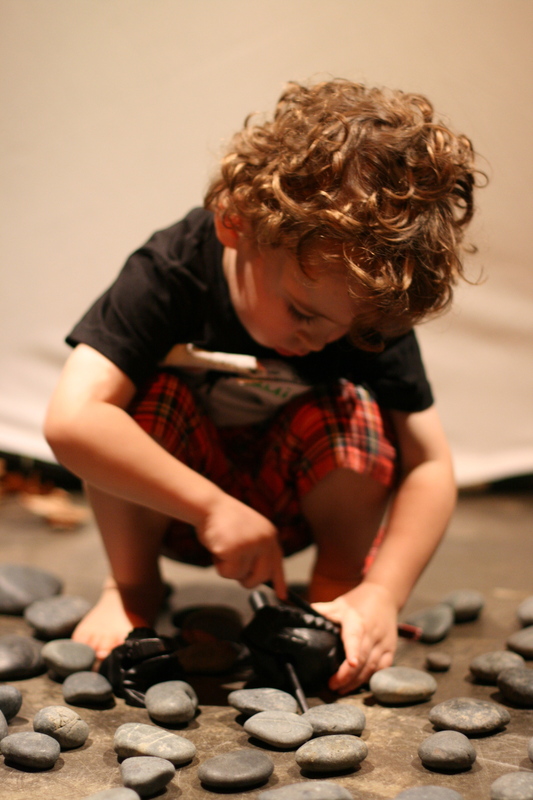 Later, the little girl placed the frogs in the frog bog on leaves, creating a special place for them – like lily pads. A little boy stood at the edge of a nest, gazing at all the activity in the room. He looked entranced, a smile on his face and his eyes wide. He whispered to his mother every now and then, their faces very close to each other. He had a juju shaker in his hands. His mother was beside him, crouching down, taking it all in with him. Sometimes they played instruments, but they also spent a lot of time just watching everything together. This was a very intimate, imaginative immersion into another world that they could share together. One of our Nests is filled with instruments made from very organic, natural materials – an African log drum, juju shakers made from large resonant seeds, caxixi made from woven grasses. Tony described later a ‘free jazz improv’ he engaged in with the children in that nest. Again, the patterns of turn-taking and unison changes in volume and tempi emerged, but also, he said, some truly innovative rhythmic licks. 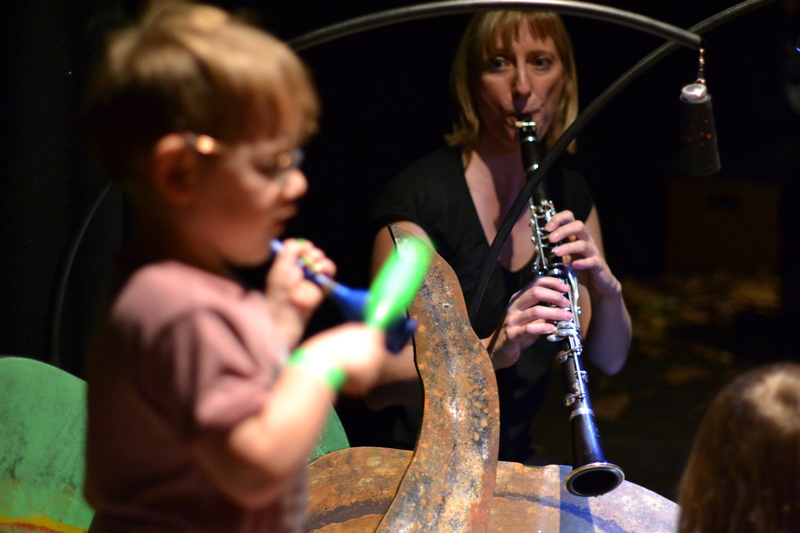 These weren’t just random batterings, but expressive utterances and gestures, offered in response to the sonic environment the children found themselves in. 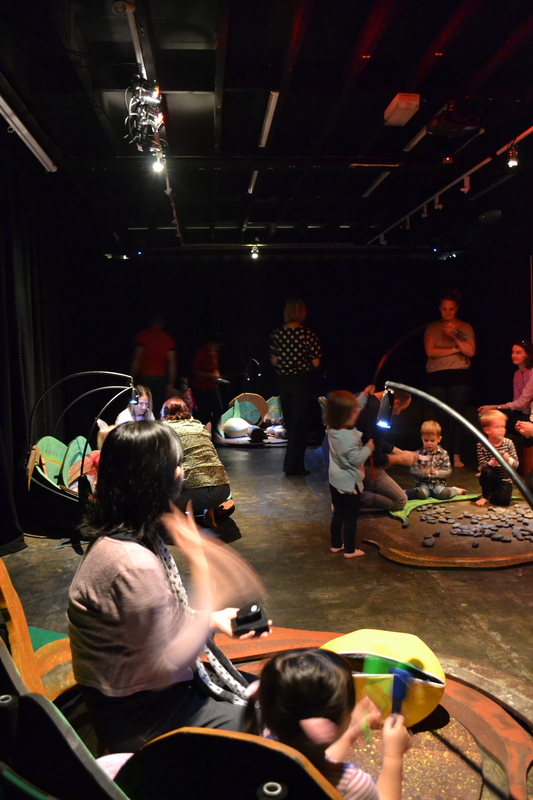 We designed Nests to encourage exactly these kinds of musical interactions, and to immerse children in a visual and aural environment that would encourage them to listen, notice, and respond. 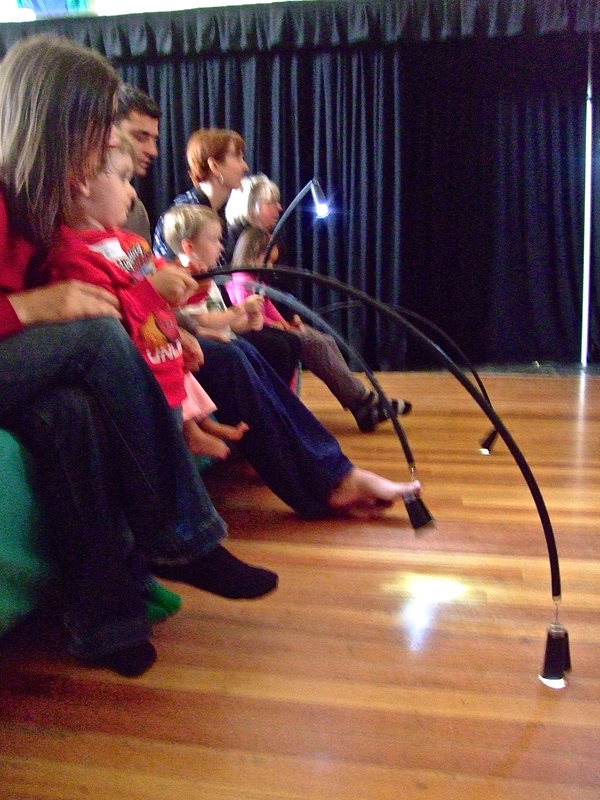 This was an un-facilitated experience where the children created their own pathways and directed their own explorations, but there were key elements in place – in the recorded soundscape and the way we’d set up the space to allow for elements of surprise and timely ‘reveals’- that guided the children’s activities and attention. Thus, in the narrative arc of the installation, the children went from individual, self-focused explorations into some truly intense and powerful whole-ensemble experiences. 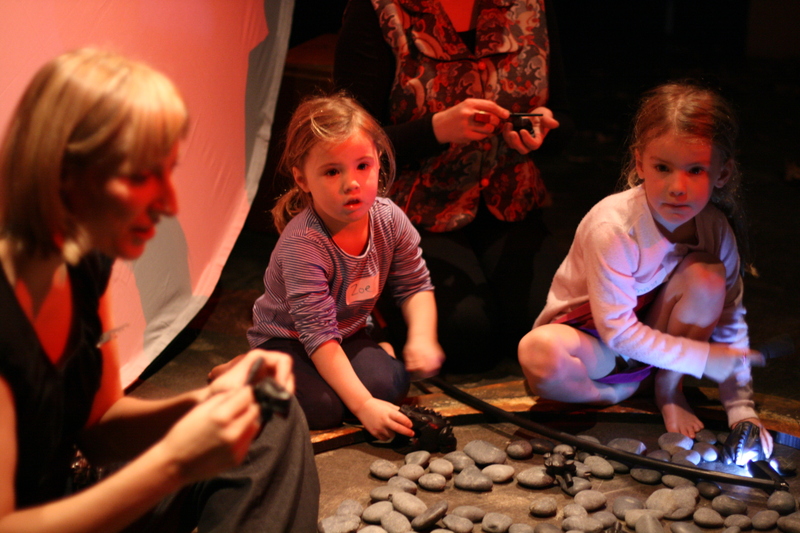 As they exited the installation, the ArtPlay staff asked children and parents for their impressions. The frogs were consistently cited as the most memorable part of the workshop. Many children also talked about the excitement of the big drum that we gathered around, making the sounds of rain and thunder as one big group. There were lots of shining eyes and excited children. Many looked like they were holding the joy of the experience tightly inside them, not necessarily wanting to talk about it yet. I don’t think they would know exactly why they had enjoyed the last half-hour so much. It is more than just the chance to play lots of different instruments. 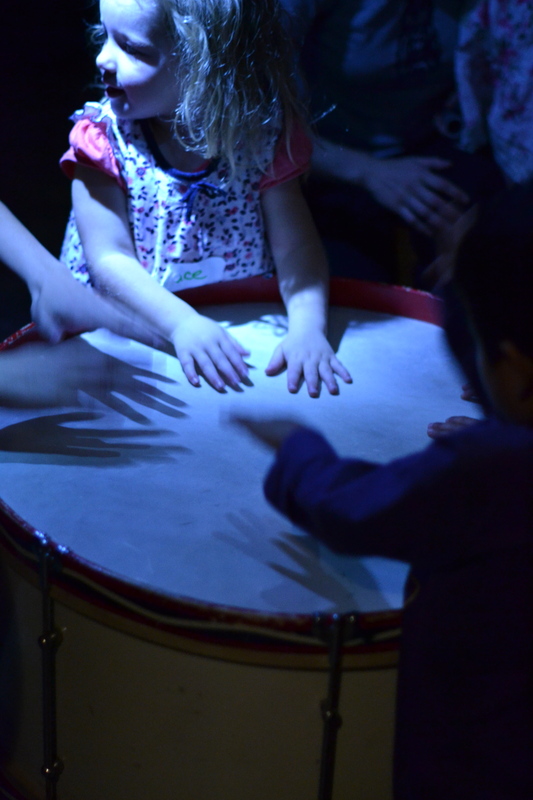 These 3-5 year olds were having a significant early experience of the tremendous sense of well-being and pleasure that playing music with other people can bring. It is a sense of being heard, of having a voice, of being part of something bigger than yourself. It’s the reason I play music, and lead music-making with other people, and it is a big motivation for continuing to seek out group music-making experiences in your life. I’m very pleased to think we may have instilled some of that motivation into these little people and their parents. 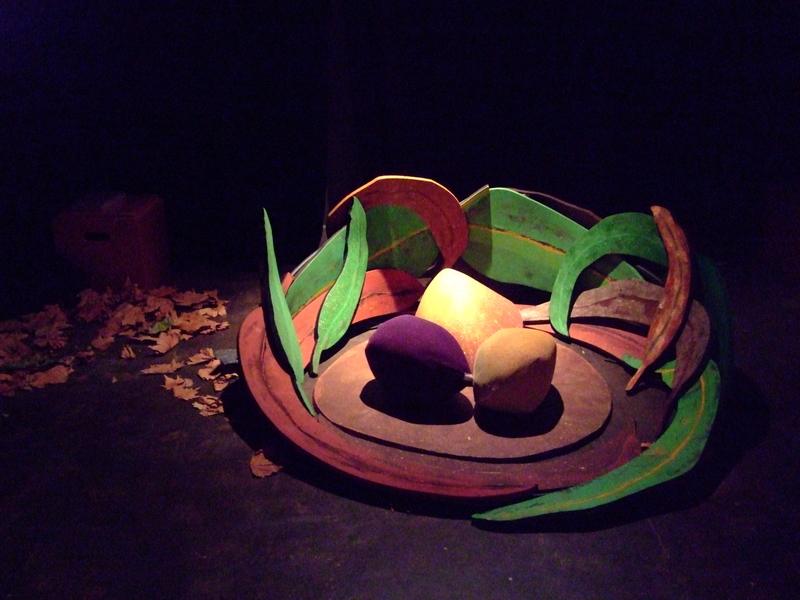 This was the third and final stage of our creative development of Nests, and we are grateful for ArtPlay’s New Ideas Lab funding for supporting this idea and enabling us to realise it and present it in the beautiful ArtPlay space. The next installation of Nests will be in July at Chapel off Chapel, as part of the City of Stonnington’s children’s arts festival Roola Boola. This post is about labels in the world of music work, and about the importance of hanging out in projects. It is inspired by some ‘hang-out time’ I got to enjoy with a new colleague last Friday evening. We had one of those marvellously unrestrained, freewheeling, fast-talking conversations that two like minds meeting for the first time can have. 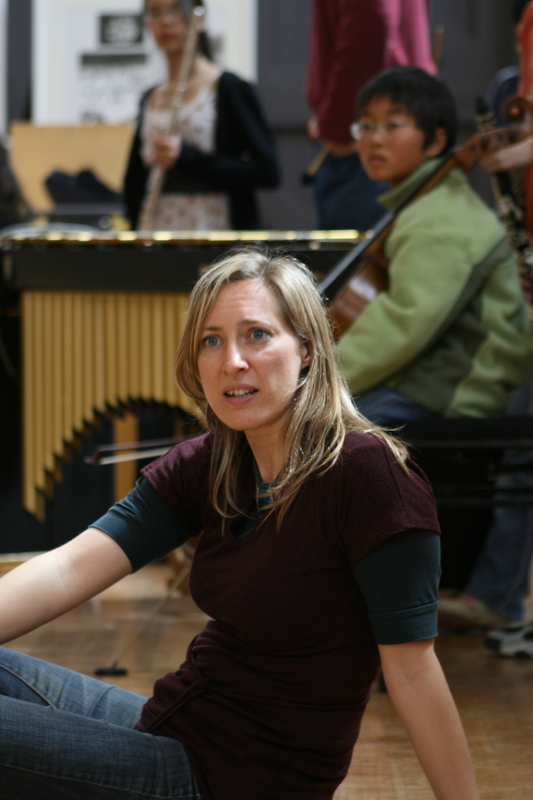 Lucy B is a music therapist, but more than that, she is a music worker. This was one of our topics of conversation – how the labels that get applied to different roles in a musical life that a leader or facilitator may play aren’t always the right fit. In Lucy’s musical world (and in her PhD research), her work fits into the Community Music Therapy category, but at the same time, she says, it’s not always a very useful term. She works with groups, building collaborations and getting music happening within groups and for individuals. It’s not necessarily therapy, even though there may be strong therapeutic outcomes. She likes the more encompassing term Music Worker (which I like because it fits with the name of my blog :-)), likening it to a case worker who might employ a wide range of approaches in their work with a client, with the needs of the client being the primary decider, rather than the therapeutic label that needs to be applied. I just call myself a musician. You know, musicians do a lot of different things – some days they will be playing and performing. Some days they will be teaching, passing on specific musical and technical knowledge to other learners. Some days they will writing and composing new material, and recording it. They will be collaborating and interacting with other musicians during all of these tasks. And that’s what I do, and some of my interactions are with young people, in schools and communities. But we are collaborating… composing… performing… It is the same set of tasks, just differentiated by degree. Other interactions will be with my musical peers. Other times again, I may be positioned as the learner. That’s what we musicians do, that’s what being engaged in the art of music everyday involves. Back to my conversation with Lucy B. We talked about her PhD research, which I was interested in because it is partly set in a developing country, so some of the questions she is asking about music projects in that context are similar to the questions I am asking about music initiatives in post-conflict countries. Lucy’s primary interest is in collaboration, and in developing a clearer epistemology of what collaboration entails in some of the complex environments in which she is working. One of the ideas that has crystallised for her is the importance of what she calls ‘hang-out time’. This is the time that you spend just hanging out with a group, getting to know them, observing how they interact and what they respond to with each other, what they might need from a new person, before you go in and get started with your workshop or therapy program. Lucy’s at the writing-up stage of her PhD, submitting very soon. Hopefully there’ll soon be many opportunities to read more of her ideas in other publications. And here’s to more hang-out time for all of us (in projects and in life). Last week was a City Beats week, which means two joy-filled, action-packed days of composing with some very imaginative, lively, sparky children. 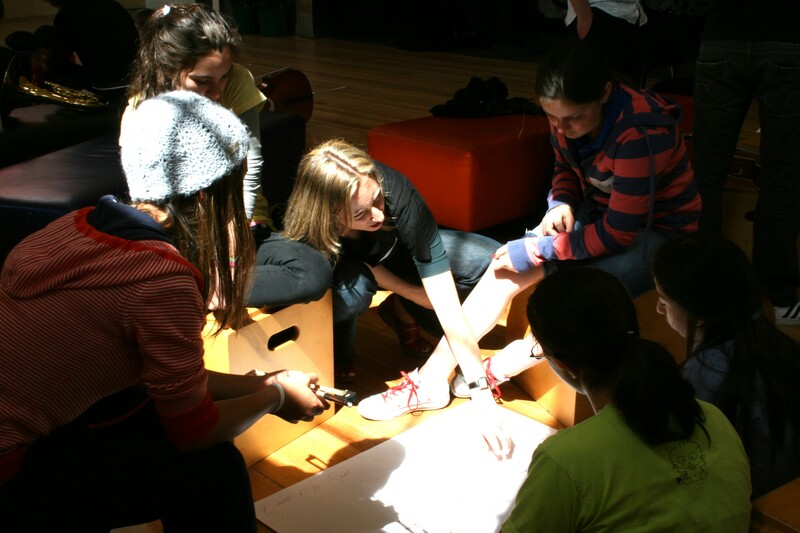 The four schools that are taking part in the 2013 City Beats program came to ArtPlay for their second workshop, this time creating music inspired by rainforests. (Our theme for 2013 is ‘Landscapes’. In the first workshop, back in March, we created Desert Music). For Rainforests, I wanted to get the children exploring the musical potential of very resonant sounds – things like bowed crotales, heavy Federation Handbells tuned to specific pitches, the tam-tam, a suspended cymbal, as well some smaller instruments like Indian bells, finger cymbals, an energy chime, and a kalimba. I think of these as being ‘wet’ sounds (as opposed to dry, scratchy sounds that very short, squat sound envelopes). In this project I also introduced two pre-composed pieces of material, as a way of locating our rainforest firmly in our own region, the Asia-Pacific. The first was a melody, Rorogwela, recorded in the Solomon Islands in the 1970s. (Go here to read about the melody and how it became well-known around the world in the 1990s thanks to a band called Deep Forest). 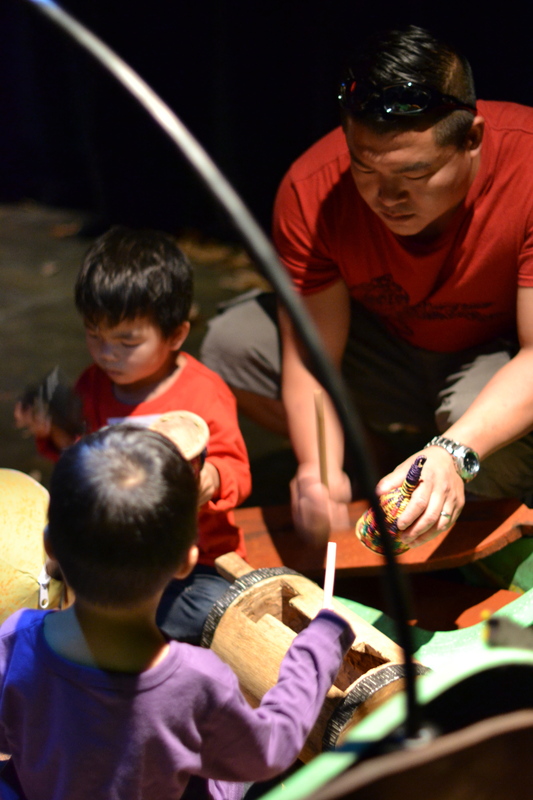 The second is a version of a Balinese Kecak (monkey-chanting), that I learned through working with the Melbourne-based gamelan group Byar (for more about Byar read here). We began by sitting quietly in a circle and tapping two fingers against the palm of the hand. “Close your eyes,” I suggested, “and listen to the sound that this makes when all of us do it together.” We closed our eyes and listened. “Can you hear the rain?” I asked. “Can you hear the sound of the rain hitting the big thick green leaves of the rainforest trees?” The children nodded and gave little smiles of recognition, eyes still closed as they tapped their palms and listened intently. Next, we brainstormed words about rainforests (birds! snakes! rain! trees! coconuts! etc), then listened to an arrangement I’d written of Rorogwela (for my assisting trio of Melbourne Symphony Orchestra musicians, playing trumpet, xylophone and double bass). 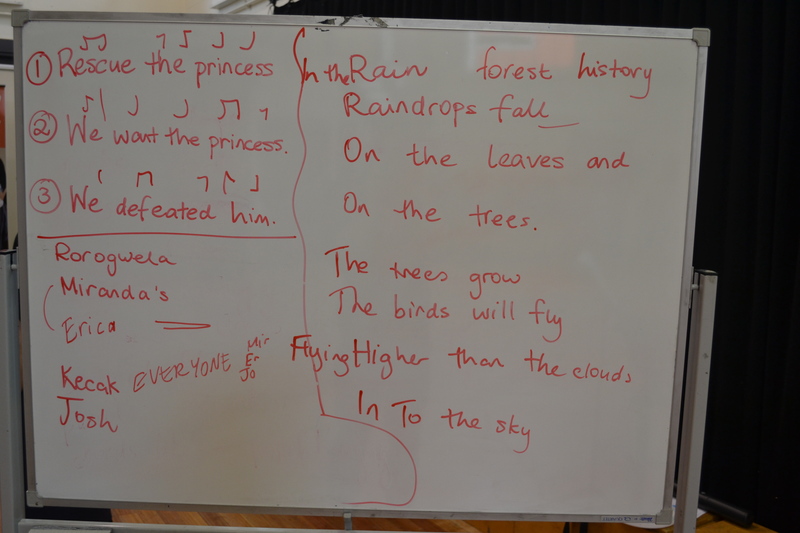 The children learned to sing the trumpet melody by humming along with it, then we selected words from the brainstorm list, organised them into phrases or sentences with me specifying how many syllables each line of music could accommodate, then we sang through the completed song, accompanied by the MSO players. We learned to perform the Kecak (three interlocking rhythms, one bar of 4/4 each – see the rhythms in the photo above, along with the words we used to help us learn and remember the rhythms), performing it with words, with clapping, and with a loud, explosive CHAK! sound. It’s a high-energy activity, exhilirating and exhausting! Then we broke into small groups to create three more sections of music – a dreamy, floating soundscape that featured many of our highly resonant instruments and bowed metal sounds, and that ended in a ‘dawn chorus’ of bird sounds (courtesy of a collection of whistles I brought along from home); a carefully-crafted gamelan-inspired piece featuring the handbells playing hocketed melodies invented by the children, and featuring the tam-tam and bass drum as structural markers throughout; and a very rhythmic, groove-based piece for xylophones and djembes that included Kecak rhythms and new melodies and rhythms composed by the children, arranged into an instrumental piece. We recorded all of our music in the last 10 minutes of the 2-hour workshop. Later in the year, the children will return to ArtPlay to paint what they hear in their recordings from each of the City Beats workshops. I shall close this post with a very beautiful arrangement of Rorogwela by Jan Garbarek. It is a sublime performance – but note that Garbarek called this a Pygmy Lullaby… He got the origins of the music quite wrong, attributing them to Africa rather than the Asia-Pacific region. I think Deep Forest may have had something to do with that. Nevertheless, enjoy this beautiful playing. I will post the recordings created by the City Beats children when they are ready. A few weeks back I wrote a post on the power of music (read it here). I confess, for a few days after writing that post, I felt kind of on-edge and grumpy. I’d written the post as one of my first efforts to unpack some of the ideas that were rolling around in my brain in response to my PhD reading, resisting being organised into orderly prose. I realised that I wasn’t quite clear on my own position on the perceived power of music. That position is still evolving and it intrigues me. I know that music can change things. Just the other day I was feeling tired, a bit head-achey, and sick of sitting at the computer. I got up and went out to the living room, picked up the guitar and start to play. I can’t really play guitar, but sitting for 10 minutes with the instrument, strumming naively to myself and seeing what I can concoct, left me with a fresher, sweeter energy than I’d had at the computer. But is this change in energy just down to the music? It might also be the change of environment, the change in pace of thought, the leaving-go of one set of complex ideas and swapping them for something altogether less demanding. Maybe I was also entraining my heart rate or my breathing to the tempo of my guitar playing (which was very slow). Maybe I was sitting straighter, so my breathing became deeper. By changing rooms I was also leaving the darkness of my study space for a light, bright open room with sunshine flooding in, and an open door leading out to the balcony. Suddenly there was a lot more space in front of me than there had been before. But, could I have got many of these same impacts by going and making a cup of tea, or practising some flamenco footwork on the balcony for a few minutes? I don’t think so. I think that the music I chose to play (a lullaby from Benin), had a part to play in my energy change. When I read this, it can give me tingles of excitement, or a slight, zephyr of thrill. A bit like the kind of emotional, warm-fuzzy nostalgia I sometimes get when I hear the song ‘Down Under’ being played on the radio or – even better – sung by children. Yep. That can make me gulp and gets my eyes all hot. Such sentiments about music (I’m referring to the quote above, not ‘Down Under’s lyrics) can be incredibly attractive to us. Peace and harmony become so achievable, and through such beautiful means! It’s an example of a Design Fallacy, where because an idea is beautiful and attractive, it becomes true for us. We embrace it, and resist efforts to de-bunk it. Purse-strings may open and funding may roll in response to idealised, romantic claims like this, but if the ultimate goal in a conflicted community is one of genuine conflict resolution and cooperation among divided peoples, then it is people who need to be active agents in such processes, rather passive recipients of a mysterious power generated by music (and, by inference, musicians as the diviners and conduits of that power). Is this notion [that music has a mysterious, inherent power] a myth, or is there evidence for it? Why is this notion so tantalising? Why do these ideas/myths persist? What are the motivations for maintaining them? If we agree to this notion, what else are we agreeing to? What is the ‘fine print’? Does the image of the power of music to bring people together devalue the actual process of making music together, and all the minute, nuanced interactions that are part of that? Is the fact that we are focusing on the final product keeping us from understanding the complexity of the process? Does the idea of music’s power give certain “special people” (eg. musicians) ‘permission’ to generate music outcomes for others, potentially rendering the participants/non-musicians passive or dependent? Perhaps one of the reasons the discourse of ‘the power of music’ is so enduring (and compelling) is due to limitations of language – it may that the process of music-making is such a complex one that our expressive language is insufficient to explain and understand it, and to recreate it in words for others. We resort to metaphor and ideals in order to make sense of an experience, but then these become embedded within the vernacular and cease to be challenged or critiqued. They become accepted as truths. Still with me? It can be an intense ride, working my way through these ideas. Ultimately, as I read through the literature, I can see evidence of the many beliefs and assumptions that people have about music. These will be culturally-based, but if we are talking about international aid contexts (where most of the projects that I am interested in are situated), it is the culture of the donors – and therefore their assumptions and beliefs about music – that are foregrounded. So what are the implications of this? That, my friends, will be for the next instalment.